B01 The Apparitions of Garabandal by F. Sanchez Ventura y Pascual. Excellent account by an eyewitness of the events. Very good as a first book on the subject. B02 Star on the Mountain by Fr. M. Laffineur. Account of the events from 1961 to 1967, by a witness. Much valuable information. B03 O Children Listen to Me by Robert Francois. Shows how the teachings of the Church came alive and were acted out at Garabandal. Many marvelous episodes from the events. B05 Our Lady Comes to Garabandal by Fr. Joseph Pelletier. Conchita's entire Diary and related documents with valuable commentary by Fr. Pelletier. The whole story up to August, 1971. B07 Miracle at Garabandal by Harry Daley. Includes detailed accounts of the apparitions by Conchita herself, prophecy of the crisis in the Church, the great prophecies and the Padre Pio "connection" (real, not fable). The book received excellent reviews by Fr. Robert Fox and Malachi Martin. Books are no longer available from The Workers of Our Lady – Canada. Please order from one of the above Garabandal Centres. Garabandal is located in the north west of Spain about three hours drive from the French border town of Irun. It is an hour and fifteen minutes drive south of Santander (80.6 km), a substantial coastal city where the Bishop of the diocese resides. (See Michelin map 572 Regional Espana).Garabandal is located 15 miles inland from the Cantabrian coast some 35 miles (50 miles by car because of the winding roads) west by southwest of Santander. Santander is an important port and because of its beautiful, expansive beaches and temperate summer climate, a vacation favourite for Spaniards. It is 250 miles straight north of Madrid and 140 miles west of the nearest port of entry from France, Hendaye-Irun. From Madrid it is a day drive. The shorter route to Garabandal is via Burgos, Corconte, Reinosa, Cabuerniga, Puentenansa and Cosio. The longer but better route is via Burgos, Vargas, Torrelavega, Cabezon de la Sal, Cabuerniga, Puentenansa and Cosio. Both routes are good. The road from Puentenansa to Cosio is undergoing major upgrading. From Santander it is about an hour drive to Cosio. The freeway south is excellent. You take the turnoff at Pesues to Puentenansa and on to Garabandal, or you can turn off earlier to Cabezon de la Sal and travel the mountain route. UPDATE: There is four-lane freeway now from the French border to just east of Cabezon. The road from Cabueriga to Puentenansa is now wider and better for a safer, easier and faster trip. TAXIS: Available in all cities and even in the smaller villages. Ask anyone. The airport, located 5 kilometres to the east of Santander city centre, has domestic flights connecting Santander with Barcelona and Madrid and Ryanair International flights from London Stansted, Rome-Ciampino and Frankfurt-Hahn. NB As Ryanair is a low cost budget airline, it is important to be aware of their strict baggage regulations. Each passenger is allowed free of charge, one piece of cabin baggage weighing no more than 10 kg with maximum dimensions of 55cm x 40cm x 20cm. If your total baggage does not meet these guidelines, then refer to www.ryanair. com to check on their strict terms and conditions of travel for carrying your baggage in the aircraft hold. 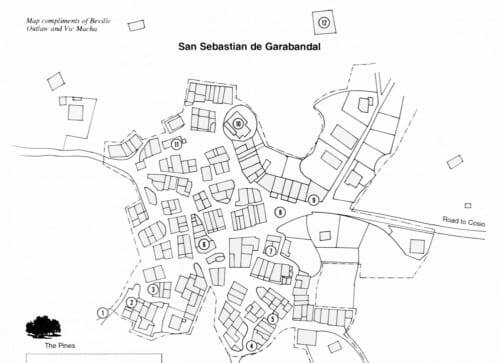 Check out the FAQ Section on Hotel Accommodation in Garabandal. Sari's Hotel offers very good accommodation, great food, wine and bar facilities. Phone number is 34 (country code) 9 4272 7145. Miguel Angel Gonzales (the Village Mayor), also offers home style accommodation and meals. Phone number is 34 (country code) 9 4272 7113. 889 Palo Verde Ave., Pasadena CA 91104, U.S.A.
By subscribing you automatically become a member of the movement. This magazine is being especially dedicated to the four Seers of Garabandal: Conchita, Mari-Loli, Jacinta, and Mari Cruz. It is also dedicated to Joey Lomangino in recognition and appreciation of his devotion to Garabandal and to the movement, which he, by and large, initiated under most difficult circumstances. For all we know, these developments, sanctioned from up above, may be the prelude to significant developments within the movement and in accordance with the Garabandal prophecies since the very next prophecy will be the Warning. We need your support more than ever. Let us stand together. GARABANDAL JOURNAL. NOTE: As of JULY 2002 a new publication with Barry Hanratty as the Editor-in-Chief. A new bimonthly magazine devoted to the events of Garabandal by the former managing editor of Garabandal Magazine (which was discontinued) for 20 years. Subscription rates: US: one year, $18; two years, $34; Three years, $50. CANADA AND MEXICO: one year, $20; two years, $38; three years, $56. ALL OTHER COUNTRIES (airmail): one year $30; two years, $58; three years, $86. Individual copies: $3. ($5 foreign). NOTE: Some limited copies available of the INAUGURAL ISSUE for $2 postage and handling in the US and Canada, and $4 (US) for all other countries. Everyone is invited to take part in Divine Liturgy (Holy Mass) and Monthly Healing Service on Saturday June 24, 2017 After the Holy Liturgy, Dr. Michael and Helen Rozeluk will make available their medals of Our Lady of Garabandal for veneration and prayers. (enter from Milner Ave). North-East Toronto area. Wheelchair accessible. 7:00 pm: Holy Liturgy (to be celebrated in both English and Ukrainian) followed by veneration of the medals and prayers for the sick. 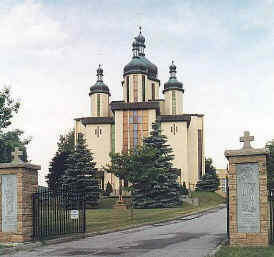 The church is accessible by local Toronto bus service and by car. See map below. For further information call Fr. Petro Dvirnik at 416-293-4656. * Posada Nuestra Señora Del Carmen. Casa Lucía. Calleja, where St. Michael first appeared on June 18, 1961. Site of the apple tree. Meson Serafin, the inn run by Conchita's brother, Serafin, and his wife, Paquita. Site of the Miracle of the Visible Host, July 18, 1962. Mari Loli's house during the time of the events. Jacinta's house during the time of the events. Mari Cruz's house during the time of the events. Site of the school the visionaries attended (presently Los Pinos bar). Map compliments of Beville Outlaw and Vic Macha. Can I arrange a meeting or conference about Garabandal? Dr. Michael and Helen Rozeluk will be glad to present a Garabandal documentary video and speak before your group or parish. Please send your request by e-mail to: ourladyca@gmail.com, or send a letter to the address below. The Rozeluks will then get in touch with you to arrange scheduling of your event. Only Conchita knows the date of the Miracle in Garabandal. People have been speculating about the date for many years. There have been several times when thousands of pilgrims have come to Garabandal on a certain date, believing that the Miracle was on that day. But that is NOT what Our Lady wants from us. She specifically told Conchita to reveal the date only 8 days in advance. She did this for a reason. That is because it is more important to follow Her messages and live the lives Our Lord wants us to live: prayer, penance, frequent confession, daily Mass and Holy Communion, daily rosary, visiting the Blessed Sacrament, prayer for priests, wearing the scapular, etc. Whether the Warning and Miracle happen today or tomorrow should not be a concern. If Our Lord wants you to be in Garabandal for the Miracle, you will be there. In the meantime, it's best to concentrate on doing what He wants us to do and trying to be what He wants us to be. 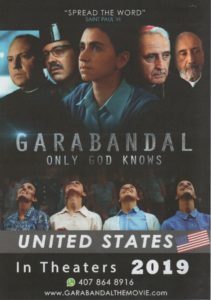 February 7, 2019: More than 150,000 viewers have seen Garabandal - Only God Knows in various parts of the world. The documentary basis for the movie Garabandal – Only God Knows, is derived from the doctoral thesis of Fr. José Luis Saavedra which he defended in 2017 at the University of Navarre in Spain under the title "Mary of Garabandal, Status of the Apparitions that Occurred in San Sebastian de Garabandal between 1961 and 1965." This was the first doctoral thesis that has encompassed a scientific study of the events of Garabandal and assured the seriousness and objectivity of that script. Garabandal – Only God Knows has brought to the screen what witnesses have said. The moviegoer will see the girls in ecstasy, listen to the messages given by the Our Mother for the conversion of the world, be witnesses to the miracle of the visible Communion and see many other inexplicable events that occurred in Garabandal. However, the movie defers the final word to the Church as to what occurred there. On February 1, 2019, Garabandal – Only God Knows premiered in ten locations the United States: Los Angeles; New York City; Miami; Jacksonville; Houston; Chicago; Waterbury, CT; Phoenix; and Denver. More cities hope to be added. The producers of the movie have asked that anyone who wishes the movie to be shown in their city, should send them an e-mail with their request. The greater the number of people interested, the better the chance of having the movie brought to your area. Please help. Mother, grant that this movie transmits Your Blessing! How and where can I get a VIDEO or DVD of the First trip to Ukraine in 2002 ? 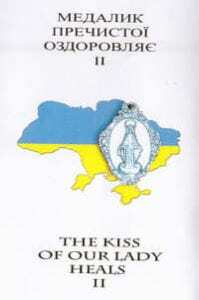 Dr. Michael and Helen Rozeluk's first mission to Ukraine in September 2002, with Our Lady's Message of Garabandal. Exciting footage of the Rozeluks' visit to Ukraine in 2002. See live video testimony from adults and children healed in Ukraine, after being prayed over with medals "kissed" by Our Lady in Garabandal. Filmed in Ukrainian with English subtitles. Available in NTSC or PAL or DVD format. Length of fim: 22 minutes. Copyright: Workers of Our Lady - Canada. P.O. Box 76607 ! 1661 Denison Street ! Markham, ON ! L3R 0N5 ! Workers of Our Lady – Canada. International Orders (Europe, Australia etc. please add $5.00 for extra postage costs). Any additional donation would be most appreciated to help with our work. "For sure I'm happy with this video-it's wonderful ... wonderful!" Bishop Antonio del Val Gallo - eyewitness and bishop in charge of Garabandal from 1971-1991. * Interview with Bishop del Val Gallo, who states the Church's official view: "Garabandal condemned? No, that word has never been used." * Available for any video system in the world. * 72 minutes, in color and black-and-white. * Available in more than 30 languages, including: Arabic, Chinese (Cantonese/Mandarin), Croatian, Czech, Danish, Dutch, English, Filipino, French, German, Greek, Hebrew, Hindi, Hungarian, Indonesian (Bahasa), Iranian, Italian, Japanese, Korean, Lithuanian, Malay, Maltese, Polish, Portuguese, Romanian, Russian, Samoan, Sinhalese, Slovenian, Slavic, Spanish, Swedish, Tamil, Tongan, Ukrainian, and Vietnamese; also for the hearing impaired. Video is $25.00 U.S., payable to "Michael Tubberty". IMPORTANT: Please specify language and shipping address when ordering. The village church of Garabandal 35 years ago. In the latter part of 1988, Joey Lomangino, received a request from Garabandal village pastor, Father Juan Gonzalez, for funds to finance the installation of a new floor in the church and to reinforce buttressed at the rear of the structure. The repairs were made possible by the generosity of many people and this is how the church appears today. Additional buttresses were needed to support the rear wall of the church. Inside the courtyard one sees the two new doors, a new roof over the portico and new support columns. One thing did not change -- the tabernacle in the village church of Garabandal with its beautiful symbol of the pelican feeding its young with its own blood symbolizing the Holy Eucharist where Christ feeds His own with His body and blood. The new floor is made of wood at the center and inlaid stone at the sides. The wood is a special hardwood imported from Africa. The sanctary has a new altar and new stone floor. The view from the balcony at the rear of the church. New stonework graces the portico and the entire courtyard. Concrete planters have also been added. The new gate serves as a reminder to those passing through it that they are on holy ground. It also keeps young children from playing in the courtyard and disturbing people inside the church who are trying to pray. View of the Pines seen from the belfry of the village church in Garabandal.